For immediate release, September, 2012 Vancouver, BC – Leftcoast TV (www.leftcoasttv.com) together with Ahmad Badawi-Camelvision Productions (http://camelvision.wix.com/camelvision) are pleased to announce their Hollywood-themed Red Carpet launch of the new season of the television series, “Get COOKING with the STARS” The series host Laurie Belle will also play host of the event on Saturday, October 20th, 2012 from 6:00pm-10:00 pm at the stunning Howe Street Art Gallery http://www.howestreetgallery.com. The evening’s celebrities in attendance will include actors April Telek, Jennifer Spence, Ben Ratner, director Katrin Bowen, fashion designer Rozemerie Cuevas (Jacqueline Conoir), Olympic Athlete Nikola Girke, Stockholders cast,(Kristian Messere, Rowland Pidlubny,Beau Daniels),BeautyNight Founder Caroline Macgillivray, BC Lions, The Travel Guys, Vernard Goud, and prestigious Leo Awards organizers Sonny Wong, and Walter Daroshin. Guests will enjoy culinary cuisine, cocktails, entertainment by DJ Myles Bigelow and International Singers (Sayde Black, Karen Holness), as well as featurettes from the “Get COOKING with the STARS” series. Tickets for the exclusive event can be purchased for $40 each at http://www.leftcoasttv.com. Partial proceeds (20%) of the ticket sales will be donated to Beauty Night Society http://www.beautynightorg. Beauty Night Society builds self-esteem and changes lives for women and youth living in poverty. 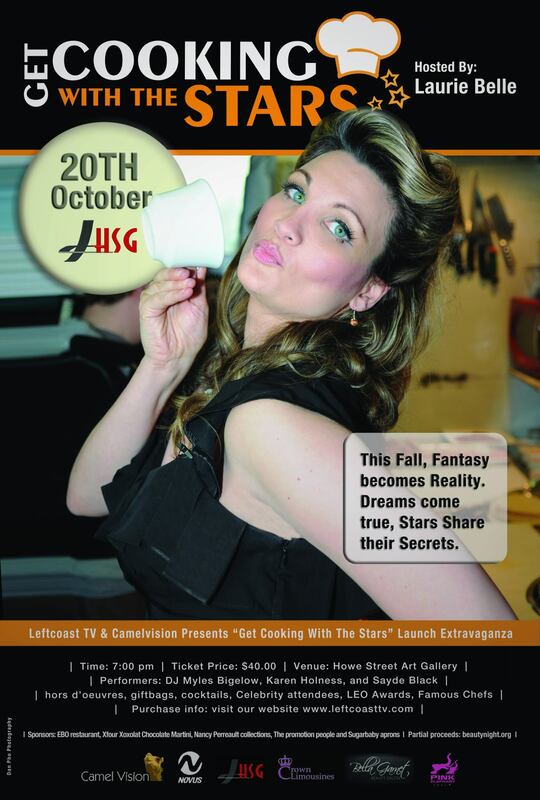 “Get COOKING with the STARS” is hosted by the charismatic Laurie Belle, also the talent of Leftcoast TV. Laurie has degrees in both Business and Communications, as well as a Master’s degree in Education. The multi-faceted TV personality is also a model and actress. Laurie has graced the pages of many magazines, billboards, and TV shows. She has interviewed Hollywood heavy- hitters such as Gene Simmons, Coco Rocha, Shannon Tweed and Amanda Tapping; as well as covering internationally renowned events including VIFF, VFW, the Vancouver 2010 Winter Olympics, and the LEO Awards. Laurie is currently developing the second season of “Get COOKING with the STARS”, whose first season aired on SHAW TV and airs currently on NOVUS in Vancouver and New Fall Airtimes Victoria (Shaw). The show invites actors and celebrities to join Laurie and chefs at restaurants throughout the lower mainland to share their latest productions with Laurie and learn recipes from some of Canada’s finest chefs. “Get COOKING with the STARS” episodes have included world renowned chefs such as Hidekazu Tojo (Tojo’s), Genarro Iorio (Le Terrezza),Chef Parichat (Pink Elephant Thai), Vikram Vij, Chef Daniel Craig (EBO Restaurant) and David Rocco (Food Network’s “Dolce Vita”). These prestigious chefs with our Host are joined by a wide variety of entertainment industry stars, including LEO Award winning actresses Amanda Tapping (Stargate, Sanctuary) and April Telek (Amazon Falls); LEO Award winning director Katrin Bowen (Amazon Falls); LEO Award nominated actress Jennifer Spence (Alcatraz, Continuum); Fashion Designer Rozemarie Cuevas (JC Designs); the CFL’s all-time receiver Geroy Simon (B.C. Lions); CTV personality Marke Driesschen; Karen Holness (Fringe, Smallville), John Marshall Jones; and famed New York Comedian Darryl Lenox (Blind Ambition, HBO). The next season promises more exciting stars, chefs, and gorgeous locales. “Get COOKING with the STARS” generous show/event sponsors include Bella Garnet Hair, Crown Limousines, EBO Restaurant, Chef Dan Craig, Xfour Xoxolat Chocolate Martini,and Nancy Perreault Collections. Gift bags filled with goodies from “Smell This” aromatherapy shop, Pink Elephant Thai, and Sugarbaby Aprons will be presented to the first 100 guests.